The scene at Cove Marina today was, in a word, cute. The green and white striped cupcake truck was cute. The owners, 16-year old twins Kate and Gavin Nelson, were cute. And the cupcakes themselves were, yes, very cute. But there’s much more to the Short and Sweet Cupcake Truck. The truck is actually a fully equipped mobile commercial kitchen/bakery. The young Nelson twins are not just accomplished bakers and entrepreneurs, but also authors (with two published children’s books between them) and philanthropists (founders of The Gift of Words, a non-profit foundation providing books to children in underserved communities). Not bad for two high school juniors who don’t yet have driver’s licenses (their dad drives the truck)! And the cupcakes don’t just look good – they taste great. But more on that later. Inspiration for the business came from a shared love of baking. Joining forces with business partner and fellow baker Ramani DeAlwis (principal of the twins’ former Montessori Middle School), Short & Sweet was born about a year ago. Kate and Ramani developed the recipes, revising and tinkering until they achieved the right results. Then after working with family and friends to find, renovate and outfit the truck, Kate and Gavin began selling cupcakes at various locations and private parties/events last October. The truck’s locations are announced regularly on twitter -- and we’d expect quite a following. At the top of the list was the banana-peanut butter -- a moist, delicate banana cake, full of banana and chunks of walnut, topped with a cream cheese peanut butter frosting. Like a good banana bread spread with peanut butter (a personal favorite), the result was a complex combination of flavors -- sweet, salty/savory – as well as textures – moist, crumbly, crunchy and creamy. The apple pie was another standout. Moist apple cake, excellent crumb, spiced with nutmeg and cinnamon, topped with chopped fresh apple and apple-spice buttercream. It had a clean, homemade taste , with none of the overly sweet artificial apple flavor found in many commercial “apple pie” products. The chocolate was also very moist, with rich chocolate flavor and a hint of espresso. The red velvet was, happily, a very natural color (not violently red like many red velvet cakes) with a deep cocoa flavor. And the real buttercream frosting was rich, creamy and sweet, but not overly so. Short & Sweet also offers carrot cake, chocolate cheesecake and mint chocolate varieties. Possible flavors “in development” include vanilla-fig and key lime-coconut. Flourless, gluten free and/or nut-free cupcakes are also available upon request. Short & Sweet is aptly named. 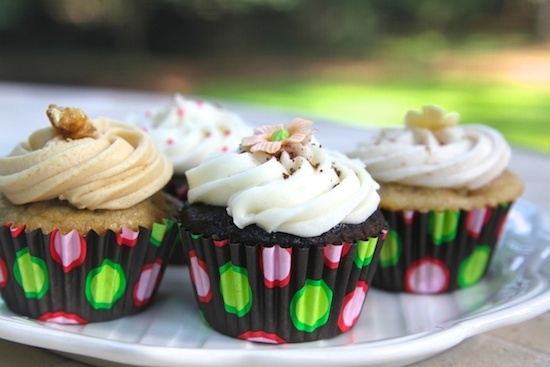 The menu is short and sweet – just cupcakes. (Drinks -- water, coffee or milk – would be a nice addition.) Service is prompt and very pleasant. And the truck is a huge hit with the short and sweet bunch – kids of all ages. The take-away? Short and sweet – follow that truck! Cupcakes sell for $2.50 each, $25 for one dozen. Visit Short & Sweet at www.shortandsweetcupcakes.com, email contactshortandsweet@gmail.com, or call 203-981-4990.